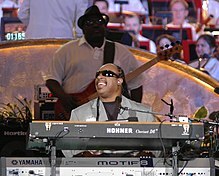 Stevie Wonder (born 13 May 1950) is an African-American singer, songwriter, record producer, musician, and social activist. Born Stevland Hardaway Judkins, his name later changed to Stevland Hardaway Morris, but he is identified primarily by his stage name Stevie Wonder. I'll leave it up to you to show it. Knowing it's so wrong but feeling so right. But all my heart can hear is your melody. Sometimes I think I would love to see … just to see the beauty of flowers and trees and birds and the earth and grass. … Being as I've never seen, I don't know what it's like to see. So in a sense I'm complete. Maybe I'd be incomplete if I did see. Maybe I'd see some things that I didn't want to see . . . the beauty of the earth compared to the destruction of man. You see, it's one thing when you are blind from birth, and you don't know what it's like to see, anyway, so it is just like seeing. The sensation of seeing is not one that I have and not one that I worry about. Someone I needed so long. ‘Cause I’m not alone anymore. And I think I can deal with everything going through your head. Where were you when I needed you last winter, my love? To the visions in our mind? Gonna keep on trying until I reach my highest ground. 'Cause I'll be standing in the side when you check it out. 'Cause we've got so far to come. I'd like to make love to you so you can make me scream. They won't go when I go. So long, away from tears. Stop it please, before it's gone too far. For all to sing, dance and clap their hands. There's no way the band can lose. Then my only worry was for Christmas, what would be my toy? We were happy with the joy the day would bring. Living in a pastime paradise. In remembrance of ignorance oldest praise. But through my eyes the light of you burns all I see. On Saturn, just to live to us is our natural high. You dropped me back down to this cold, cold world. They couldn't touch us even if they tried. Would be jammin' until the break of dawn. 'Cause this time could mean goodbye. You too might be overjoyed, over love, over me. 'They're so in love' on our skin. Cooling the red hot love that we are making.